You don’t go to Fort Lauderdale to spend the entire time indoors. Recovery First is able to capitalize on its pristine surroundings, and provides patients with access to the historical and popular Fort Lauderdale beaches. Patients are encouraged to roam the beaches in their free time, relaxing in the gentle Atlantic surf, practicing yoga on the white sand, or reflecting during an afternoon walk. At Recovery First Fort Lauderdale East (RFFLE), we pride ourselves on our Veteran’s Choice Program (VCP). Working with the Department of Veterans Affairs, Recovery First’s VCP helps to provide struggling veterans with inpatient and outpatient care. We also have a focus program for our Nation’s First responders. The clinicians at Recovery First Fort Lauderdale recognize that addiction often exists alongside other treatable mental health issues. Through an integrated treatment approach, Recovery First is able to treat co-occurring and secondary mental health disorders such as anxiety, depression, post-traumatic stress disorder (PTSD) and bipolar disorder. 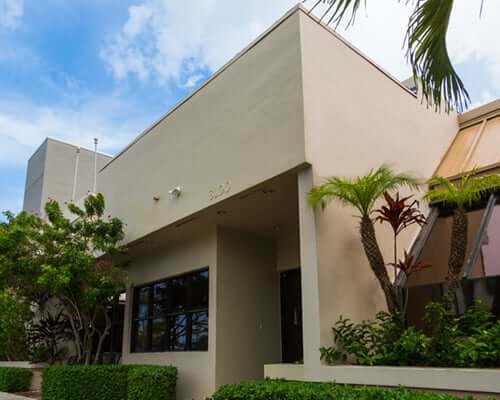 At Recovery First Fort Lauderdale, our treatment team of professionals includes board-certified psychiatrists, case managers, therapists, an attending physician, behavioral health technicians, biomedical techs, and licensed vocational nurses. Master’s level therapists (LPC, LCSW, LMSW) lead experiential therapies, and our clinical team is staffed with master-level professionals and certified substance abuse counselors. Approximately 40% of Recovery First’s staff members are in recovery, so they understand first-hand what it’s like to battle addiction and thrive in recovery. This gives the staff a level of compassion and empathy that is evident throughout the treatment process. Recovery First Fort Lauderdale has several staff members available who are fluent in Spanish, including a therapist who is also a veteran who has started a group specifically for Spanish-speaking veterans. The Joint Commission for Behavioral Health Care Recovery First Fort Lauderdale is accredited by the Joint Commission for Behavioral Health Care, an internationally-recognized symbol of healthcare quality and the gold standard of care for the industry. For patients, this accreditation means they can trust that Recovery First meets or exceeds national standards for patient safety and effective care in addiction treatment.